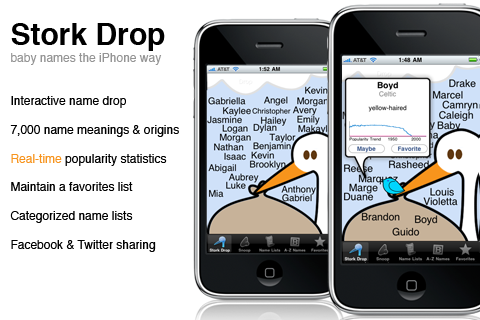 The latest version of Stork Drop is now available for sale in the App Store. This version features a helpful little bird who knows a lot about baby names. He will also help you share your favorites lists to Facebook and Twitter. Despite all the bad publicity of late, a special thanks goes out to the reviewers at Apple. No doubt overcome with the spirit of season, they approved this version despite a small technicality that would have held it up for two more weeks.